In 1749 Louis XV was inducted into the chivalric Order of the Golden Fleece (Toison d'Or). For the occasion the Court jeweller André Jacquemin mounted the great French Blue diamond and other gems from the Crown Jewels into an elaborate insignia, which was known as the La Toison d'or de la parure de couleur ("Golden Fleece of the Coloured Adornment"). Professor Farges, in an interview published on the MNHN website, notes that so many exceptional stones had never before been put in the same setting. The result was a "masterpiece of Rococo jewellery", a splendid and unimaginably precious object - if to modern eyes, a thoroughly bizarre one. As well the French Blue, the parure included the 32-carat "Bazu" diamond, and a red spinel of 108-carets, cut into the shape of a dragon. 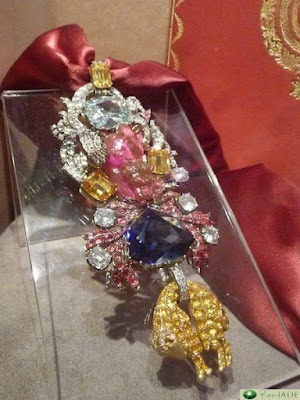 There were also three yellow sapphires and five diamonds of 10 carats each. 83 small diamonds painted red on the back represented the fire from the dragon's mouth and a further 112 painted yellow represented the Golden Fleece. The Roman Catholic order of the Golden Fleece (Toison d'Or) was originally founded by Philip the Good of Burgundy in 1430 and still exists today; according to Wikipedia it is "referred to as the most prestigious and exclusive order of chivalry in the world". In the 18th century the Spanish branch of the order was headed by the French monarch's Bourbon cousins and was, therefore, a potent symbol of Bourbon power. The insignia features the fleece itself, an emblem of authority and kingship, and the ever watchful dragon from whom Jason stole it. 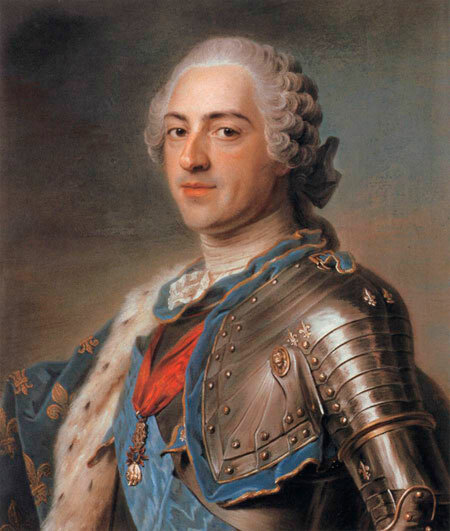 Louis XV is depicted in several paintings wearing the parure attached to his coat. It was later presented to both Louis XVI and Marie-Antoinette, though there is no evidence that either of them wore it. The creation of the Toison d'Or provided an opportunity to reset a number of valuable, if underused, Crown Jewels. The red spinel, known as the Côte-de-Bretagne, was the very oldest gem in the royal coffers, one of eight coloured stones which had originally belonged to Anne of Bretagne, wife of Louis XII, and her mother Marguerite de Foix. Its companions had disappeared long ago in the French Wars of Religion. It was shaped into a dragon breathing "covetous flames" in 1750 by Jacques Guay, graveur en pierres fines du cabinet du roi. 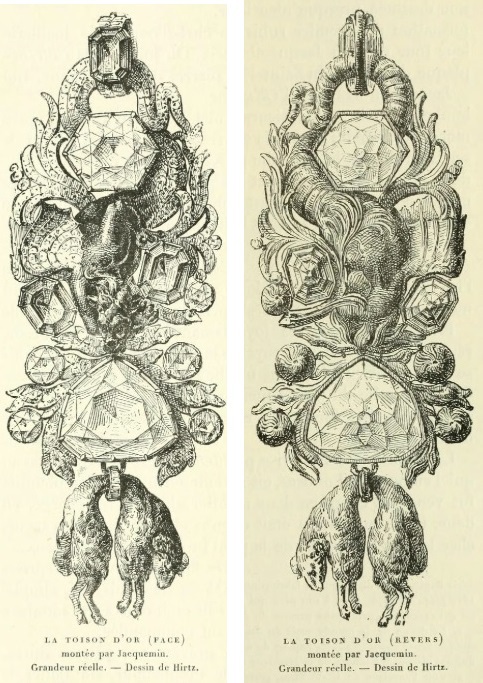 Drawings by Lucien Hirsz depicting a lead cast, now lost, of the Toison d'Or. The spinel was the sole original element of the Toison d'Or to be recovered from the 1792 theft. In 1796 a painter called Brard, on mission in Hamburg, reported to the Revolutionary government that the dragon was in the possession of a certain Lancry, an agent of Cadet-Guillot. Lancry met with Brard and his colleague Panel with a view to selling rubies to the French government; the French ambassador in Hamburg, was authorised to offer 50,000 livres. It is not clear whether the spinel was recovered at this time. It was said at one point to have been in the possession of the Royalist general Danican, and may alternatively have returned to France with the comte de Provence at the Restoration. The second diamond is usually identified as the "Bazu" diamond (named after David Bazeu, who sold it to Louis XIV in 1669). The illustration by Jacquemin depicts a large clear square gem but the engraving in Bapst's book, based on a later cast, shows a different, hexagonal stone. In his interview, Professor Farges stated that he was researching the whereabouts of the second diamond and might have found some clues. He is reported to have discovered a glass model of an anonymous diamond which may be the Bazu in the British Museum - I haven't been able to find any further details. 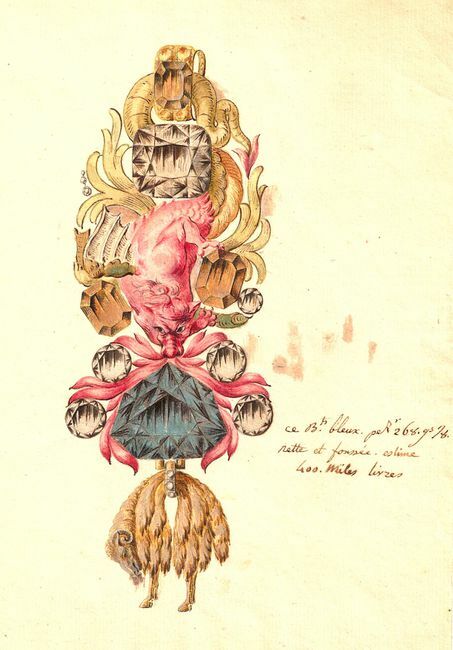 Scott Sucher initially based his reproductions on Bapst's colourless hexagonal jewel, but for the replica Toison d'Or a light-blue "Baroque cushion" was preferred. The project for a replica originated with the sponsors of the 2011 documentary film by Thierry Piantanida. François Farges acted as consultant, whilst the Genevan jeweller Herbert Horovitz funded and co-ordinated the work. A gouache (left) by the Genevan artist Pascal Monney, produced in 2008 as part of the project, is an accurate representation based on the research of Farges and his colleagues. The various elements took over eighteen months to assemble. Scott Sucher cut the French Blue and the Bazu out of CZ and modelled the other larger diamonds and sapphires, which were cut in India from synthetic materials. The spinel was recreated in red glass by Etienne Leperlier, using wax moulds prepared by Pascal Monney. The metalwork and stone setting were undertaken by Jean Minassian in Geneva. The finished insignia is six inches high and weighs about six ounces. In 2010, 218 years after its theft, the replica was ceremonially presented at the Hôtel de la Marine, which once housed the Garde-Meuble. It was also temporarily exhibited in the Natural History Museum in Nice in 2011-12. At present the replica is back in the vaults in Geneva, whilst a sponsor is sought to meet the cost of the materials: Professor Farges hopes it will ultimately be possible to put it on permanent display in the Mineralogical Gallery of the MNHN in Paris..
Interview with François Farges, MNHN website.